I know you have seen these EVERYWHERE on the internet, so what's one more? Right?! I also know that this is a totally unoriginal idea, so I in no way "claim" that it is. I took my camera strap off and measured it. You'll need to add length and width to accomodate your seam allowances. I think my strips were about 2.75 x 27". I chose two different fabrics, but you could easily do this with just one. In that case, I'd probably make your cuts around 5 x 27". Start off by sewing your strips -right sides together- with a 1/4 inch seam. Press down. This step would also be totally optional, but I personally hate how rough and uncomfortable my camera strap is, therefore I added a little bit of padding. You could make this as thick or thin as you wanted. I had extra flannel from a rag quilt so I just used that and I think it's perfect! On the ends of your straps, fold over 1/4 of an inch and press. Fold over again 1/2 inch and press again. This will give you a pretty seam! I stitched the seam twice. Depending on how big you made your fold over allowance, you could do more it you wanted. Not only will it make the seam a little stronger, I thought it made it look a little more decorative. The hardest part out of everything is turning your strap right side out! Once you do that, iron it flat and you'll end up with this! Very Cute! I love the colors you used. Do you know if there is a standard size for camera straps? If not, how much extra should I leave on the sides to make sure that the strap fits snuggly, but still goes on easily? Love the fabric you used! Very pretty! What a great way to dress up the utilitarian camera strap. I love that you added padding, too. Thanks for sharing. 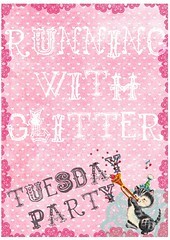 GREAT TUTORIAL!I'd love it if you joined the Glitter Link Party! This is such a cute idea (and new to me). Thanks for sharing!